pear and green salad was inspired partly by salad at my favorite chicken tender place: maniac’s, partly by strawberry spinach salad and partly because pears are now in season. the spiced pecans in this salad are very similar to the ones served at maniac’s. be sure to make extra of these, because you’ll want to munch on them! they store really well in the fridge, after cooling. 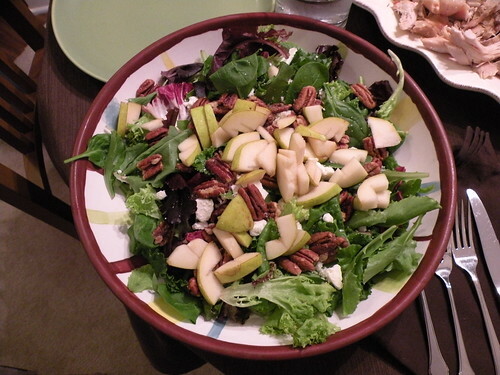 place salad greens in a large serving bowl, followed by feta, pecans and pears. toss with dressing or serve on the side, whichever you prefer. melt butter in a microwave safe bowl, stir in cumin, red pepper, sugar and salt. fold in pecans, stirring to coat. spread pecans in a single layer on a jellyroll pan. bake for 20 min., stirring occasionally. cool and store in an airtight container. blend ingredients well in a dressing shaker.